Good morning, everyone! I've heard such horror stories of the extreme heat, flooding rains, and forest fires that have plagued many of you in the U.S. and Europe and I'm so sorry... We've somehow managed to escape all of that here in western Pennsylvania. It has even been downright chilly some mornings to the point where I've had to throw on a lightweight bathrobe when I first get up... most unusual for the summer months. I hope Mother Nature can get her emotions under control and things calm down for all of you very soon! It's been two weeks since my last post and I want to thank you all so much for your kind and very insightful comments on my walk across the border into Mexico and on those interesting creatures that have been visiting my yard (especially that very odd groundhog who thinks he is a member of the family and settles down on our front porch from time to time!). Since my previous post, I've traveled up and back to New York State for a visit with my mom (all of my siblings were there, too!) and to attend my 45th reunion (more about that later). Thankfully, I've also managed to finish my Christmas ornaments for June and July. Would you like to see them? For my June ornament choice, this classic Prairie Schooler Santa (the 2016 design) caught my eye. Isn't he cute with his arm wrapped around his reindeer buddy? I chose a 40 ct. linen--Vintage Country Mocha Newcastle--to stitch him on and I was really pleased with how well the white shows up. I'll definitely be stitching more of the PS Santa series on this same fabric. Another ornament for my tree! Since this has been such a busy month, I stitched this quick and easy JBW design called "French Country Snowflake" for my July ornament. I love the dusty blue fabric, but have no idea what it is called--it was just a small piece of 32 ct. mystery linen that I had in my stash. The fabric color in my photo is not true to life, but the second photo of the actual finish is pretty close. The original design had the word "Snowflake" charted underneath, but I wanted to create a round ornament so I simply left that off. How many little winter motifs can you spot in the snowflake? I think the reindeer right in the center is my favorite. But, then again, that sweet little cottage at the very bottom is pretty cute, too! I made a two toned cording from DMC 932 and 3865 to finish this one off. So, I'm all caught up with my monthly ornament challenge--on to August! Throwback Thursday... Here is an oldie, but goodie! 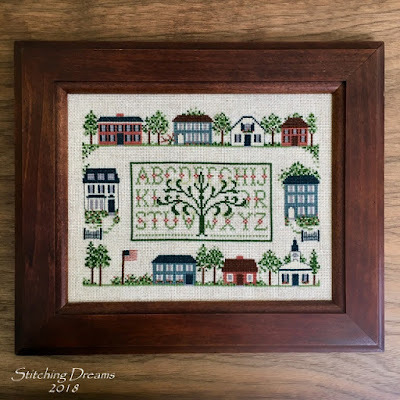 I stitched this way back in 1987 when we were living in Silver Spring, Maryland for a year and I was pregnant with my youngest son--nice memories! Some older pieces look, well, o-l-d--and tired--and like they really belong to a long ago decade, don't they? But, this one has held its own--I never tire of it and see it daily as it hangs right by the door in my family room. The name of this Ann Taylor Nelson design is "Town Square" and it so reminded me of my little home town with the pretty houses and the church in the lower right. We had no town square, but we did have a park with a lovely band stand/gazebo where people would often meet up. I'm not sure what fabric I used, but it might be Davos--and I'm sure I used the suggested thread colors as I wouldn't have dared change a color way back then! 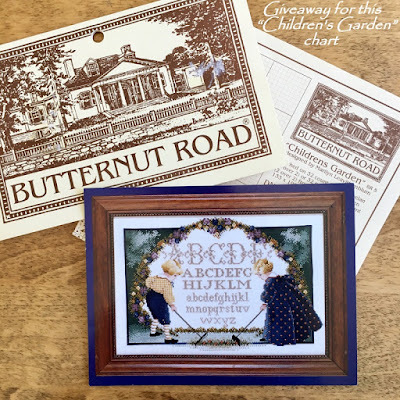 I did a little search and you know what--the designer has a website where she still sells her older charts if any of you are interested: ATN Designs. 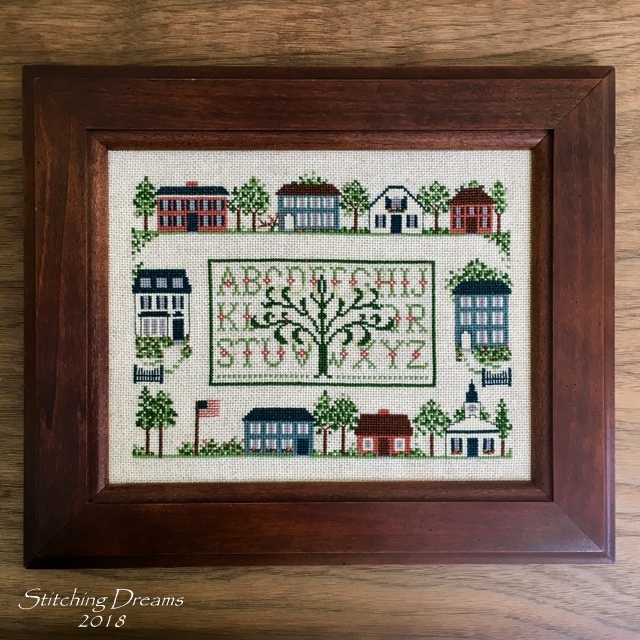 "Town Square" stitched more than 30 years ago! 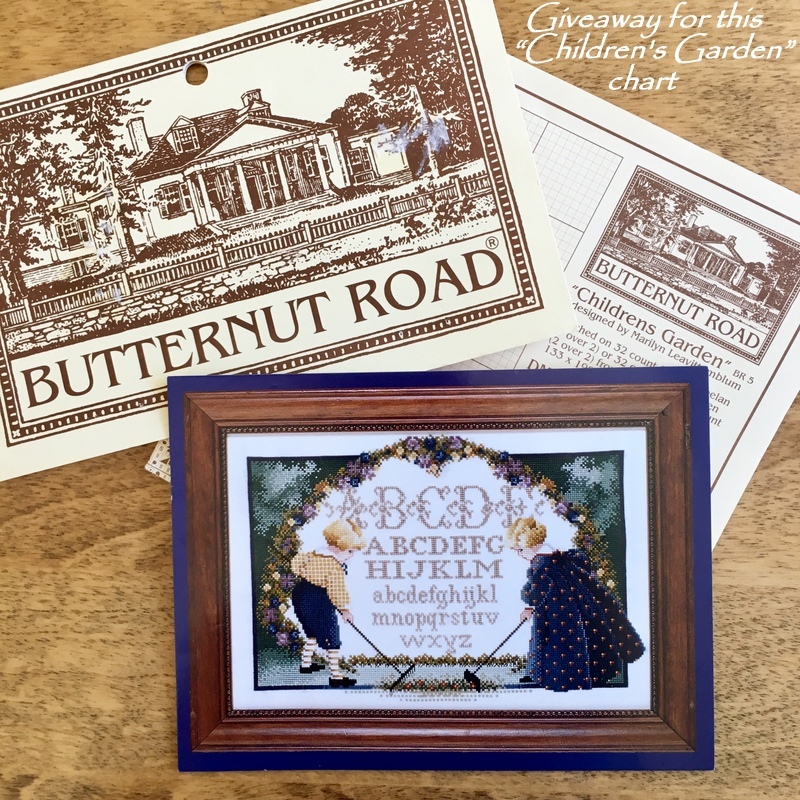 Congratulations, Karin--please email me your mailing address and I will get the chart off to you as soon as possible. And for those of you who didn't win--keep an eye on this spot! More chart giveaways will be appearing in the future. Winner of this chart is: Karin Carnine! So, my high school reunion... 45 years had passed since I saw most fellow members of the Class of 1973! What did I expect? I was SO nervous and on the 3 1/2 hour drive up to New York, I began breaking out in hives! Yes, at least three appeared on my face by the time we reached the hotel. I took a Benedryl which calmed them down as I attempted to relax. But, you know what--I was being silly because as soon as I walked through the doors of the venue and saw my old classmates, it was as if time had melted away. My three best girlfriends (who had attended school with me since we were just five year old kindergarteners!) were all there and we spent the evening chatting and reminiscing and laughing and making new memories together. Oh, everyone in the class looked a bit different--some had lost a little (or a lot!) of hair, some had spread out through the middle, all of us had wrinkles, and still others had blossomed! But, it was such a fun evening and I'm truly glad I got up the courage to go. There were only 100 students in my graduating class so I really knew most every one of the 30 who showed up that evening. I hope to see everyone again for my 50th (gulp!) in five years, but until then we've been emailing and texting and simply renewing our friendships. There is just something special about old friends who knew you "back then," isn't there? A funny thing happened the morning after the reunion when we met up with two of my girlfriends for breakfast at the hotel. The one showed up with a copy of the local newspaper folded under her arm and said she had a surprise for me. As I opened it up--who should be pictured on the front page, but me and my husband as we were checking in at the reunion! 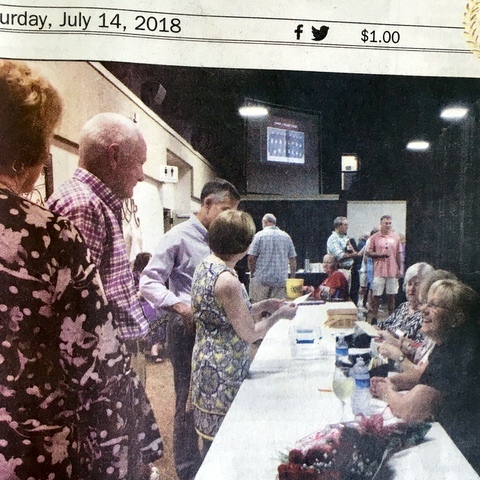 (It must have really been a slow news day in my small town for them to feature us :) It is a horrible photo, but, yes, there we were right in the middle of the photo--me with my back to the camera and my husband looking on as we find our name tags. So, does this mean I'm famous now?! Baking news... I've been doing a bit of baking lately and wanted to share one of my favorite recipes with you today: No Fat Banana Applesauce Muffins. You can find it right here--it is the perfect way to use up those overly ripe bananas that seem to appear overnight. So moist and dense; I love them--and they whip up in no time! The little blue and white pitcher was something I picked up at Goodwill last month for $2.99! We celebrated a couple of big occasions earlier this week--my husband's birthday (he caught up with me in mid-July!) and our 41st wedding anniversary on Monday. 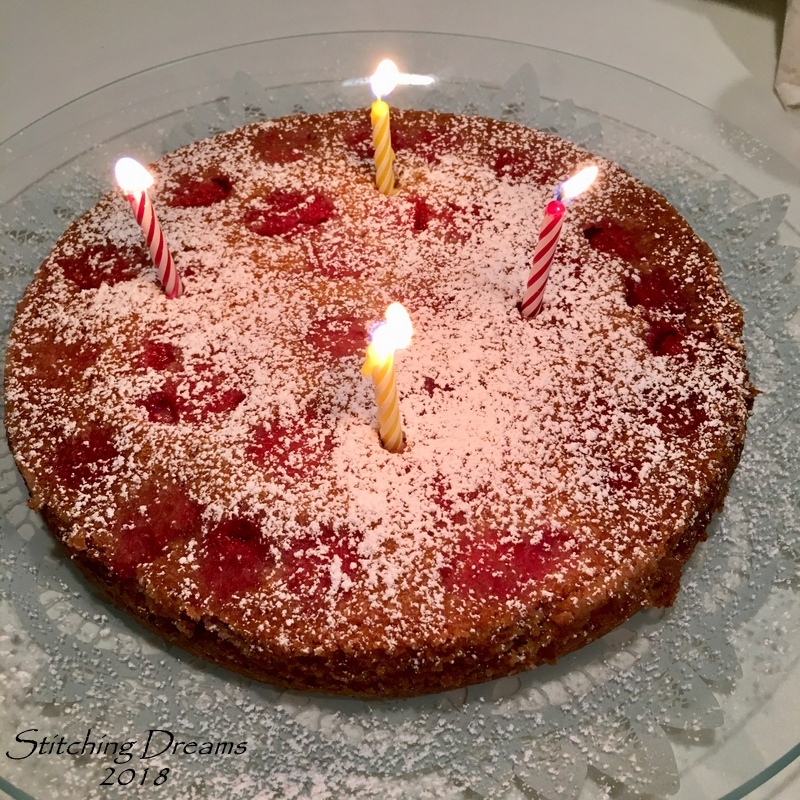 I wanted to make a simple cake and what better one to try than our very own Mary's Raspberry/Wineberry Cake that she posted on her (and RJ's) blog, Stitching Friends Forever on July 14th. I had never heard of Wineberries before, but had just purchased some juicy, red raspberries so I thought it would be a perfect one-layer cake. Mary, it was fabulous--so easy and oh, so yummy. Will definitely be baking this one again--thank you for sharing! I'll leave you with a cute photo of my new "pet!" This sweet baby rabbit visits every morning, nibbles away at the clover in our grass, and hops up on our patio to sun himself. He is so tame and lets me come within a few feet of him--he doesn't seem to fear me at all! I hope he sticks around for a while--I do miss having a pet in the house, but with all the traveling we've been doing, it just isn't going to happen for quite a while! Carol, I think the Santa snuggling with the deer is my favorite PS Santa I have seen to date! The French ornament is sweet and both your finishes are lovely. I'm impressed with your two tone cording, I'm still struggling with making one tone cording. Your Throwback Thursday has certainly held up to the test of time. It's a charming stitch. How tempting is your Apple muffin display!! I have had your blueberry crisp recipe hanging on my refrigerator waiting for better baking weather, I'll add this one to it. I was thrilled you made the raspberry cake and you enjoyed it!! Great idea to dress it up with a little confectioners sugar. I'm glad you enjoyed your high school reunion and reconnected with old friends. I bet it doesn't even seem like 45 years have passed by. Please send your weather this way, we are living in monsoon weather here! Carol, your two ornaments are adorable and impeccably finished, as always. I Love the PS Santas...have them all..but not stitched a one..what am I waiting for??? I'm glad you enjoyed your reunion and have reconnected with old friends..they are usually the ones who know/love you best! The sun is out today..... after days of cloudiness and rain....so I think your weather is making its way east--thanks! Both ornaments are adorable. I keep saying I am going to do a PS Santa. I think this and Carolina Stitcher's post this morning has me on it today. I love the snowflake. The little motifs are adorable within in. You are right about your oldie still looking fresh. I love my old pieces though. Such good memories in each stitch. I love the reunion picture. Small town newspapers are great. You are making me rethink whether I should go. I have dismissed the idea. In fact, it is my 40th this year and my town does the reunions in the fall during football season. Hmmm...food for thought. The cake looks delish...Congratulations on 41. I love bunnies too. I always love your posts. Good Morning Carol, I am glad you are enjoying nice weather also. I am sitting here with a rare treat, the windows open. The little house finches are eating seeds from the windowsill right in front of me and there is a cool breeze. What lovely ornaments. The JBW is so sweet. Town Square reminds me of our Greendale we lived in for 10 years. I still miss it. Now we live in the center of our village here. It is not a town square though, but very old buildings are about. I hope you get a kitty again some day Carol. ;) I would be lost without my poodles. So glad you enjoyed your reunion. How nice to be able to re-connect. I find that when I see my best friend from HS, which is rare, it also feels like no time has elapsed. Fun ornaments. That round one is so perfectly round! 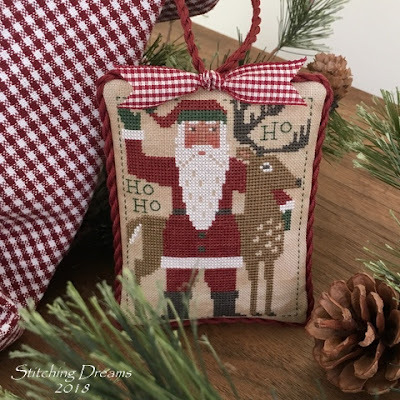 Carol, I always enjoy seeing what you pick, stitch, and finish for your monthly ornament challenge. Both are darling, but my favorite is the PS Santa. I love the deer in this one. You town square piece is a classic. I am happy to hear that you had a good time at your high school reunion. Happy belated anniversary wishes to you and Tim. Carol, I love villages and that one from 1987 is gorgeous. The French Christmas Ornament is beautiful as well You do such a good job with your finishing. I have my 45th reunion in August and your class sounds like mine. We only had 150 people in the class so we all knew each other for the most part. My best friend from High School will be attending so I plan to hang out with her. You know as much as I LOVE Prairie Schooler I have not been a big fan of the Santas. In fact I have some of the charts that I was thinking of passing on to a friend. I stitched the Caroling Santa and I want to do the Bicentennial Santa. I saw that Priscilla shared her PS Santa Tree on Instagram this morning....it was beautiful. One last thing...LOVE your muffins and the vignette. Blue and White speaks to my soul!! I love your ornaments! Your finishing is always so lovely. I'm definitely going to have to try the recipes you shared, too. I'm always looking for good banana recipes, and I love single-layer cake recipes (multi-layered is too hard :D). Thank you for sharing! No worries, Carol, you're always going to have an audience! Good try! Haha. You are famous, well, to us because I have heard your name mentioned on a few flosstubes! Glad your reunion went well; I would've been a nervous wreck too. Wonderful finishes as usual. This weekend I'm going to attempt cording, wish me luck! Your two finishes have goaded me on. A belated Happy Anniversary to you and your hubby! You're so clever to start stitching your Christmas designs now. I love the blue and white one! What a sweet little white jug with a blue flower design too! Oh Carol I always wait for your post , and love to read them all . Your stitching is so beautiful ,and I always love to see your finish, I can't seem to find enough time to spend on mine so this Autumn I want to make more time to get one per week done on my finishes I have a really big basket full .It has just been far to hot here. I love your stitching from the past again beautiful . Your cooking looks so yummy too. Congrats to you both on your Anniversary ,and your husbands Birthday. Hope your mother is well and you all had a wonderful time. Hi Carol, It's always a pleasure to read your blog and marvel at your latest finishes :) You didn't disappoint!! Both look great but I have a preference for the simple JBW. Those little muffins just look so tasty. Dear Carol, your cross stitch is always great! The 41st birthday cake was sweet, like 41 years with a husband. I was surprised to know that you've only done 10 of those Santas! But nice to know you have a ton more to stitch. This one is quite cute. I'm surprised the white popped that well on vintage mocha. Maybe the fabric color is a bit darker on 40 count. Love the snowflakes. Nice to mix up styles. Love your TBT piece, especially since it was stitched in my neck of the woods. And so now you and Tim are celebrities! I guess you'll have the article framed for posterity. Glad you had a good time at the reunion after all that worrying in advance. Yummy looking cake for the birthday and anniversary celebration. those events definitely deserved something special! Carol:Your Town Square is a beautiful design, you picked the perfect frame. I love your new ornaments, your finishing is perfect. I have never gone to a class reunion have no wrangler to go. Congratulations on the great photo op in the paper. The cake looks yummy, congratulations on 41 year, Mike and I celebrated 41 years on June 11 this year, happy birthday also. Your bunny is so cute, we have way to many I which they would move on and leave only a few around, they eat my strawberry’s them little stinkers. Hi Carol! I loved this blog post. Your ornies are beautiful and make me want to pull out the Christmas stitching. We graduated the same year. My reunion was last weekend. I didn't attend. I'm glad you enjoyed yours. We are heading out for our yearly great Canadian Adventure vacation so I have been cooking and doing laundry and packing supplies. We have to take everything we may (or may not) need as the only way to get the cabin is by boat and town is a long, long way from us. Thank for the cake and muffin recipes. I love that the muffins are low fat. I will need all the low fat, low carb recipes I can get once we get back from this vacation. It is not a weight watchers vacation, for sure. Really enjoyed hearing about your month and will look forward to the post for August. Beautiful stitching. 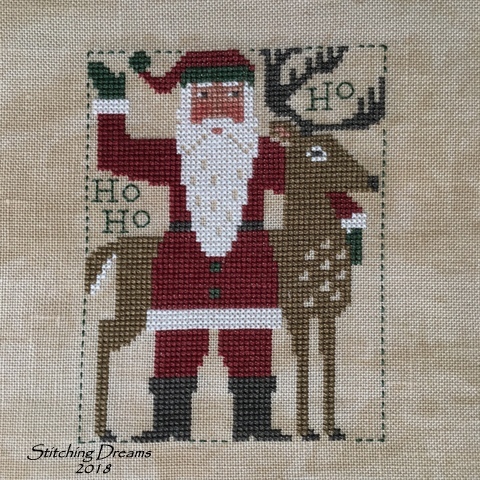 I was just organizing my patterns and found that Santa and reindeer. I should get it out and work on it soon. Great stitching and finishing as usual. I especially love that snowflake. I love the way JBW puts all those little symbols in their designs. Well your bravery paid off. Sounds like the reunion went very well. My high school class has never had one that I know of. We have moved a lot so maybe I just didn't know about them. Your baking looks wonderful. I think I will try the cake too. We have such wonderful berries out here. Way too hot and dry for the Pacific NW. I can't remember the last rain!! Yes, I live near Seattle!!!! I just love your Snowflake! I may need to stitch that up for our tree too. I always liked those Santas but I never realized there were so many! I do hope you get to stitch them all. A Christmas tree with just those for ornaments would be beautiful. Mary's cake certainly looks like it was yummy. Adoro Prairie Schooler, li ricamerei tutti! Probabilmente per Natale farò qualcosa anch'io! Sei stata brava ad andare al raduno, è bello ritrovare le amicizie, in fondo si invecchia ma non si cambia mai! Lovely stitching and finishing on the ornaments! ein wunderschöner Post. Deine beiden Weihnachtsornamente sehen fantastisch aus. Besonders die Schneeflocke finde ich wunderschön. Deine alte Stickerei ist ein Traum, wunderschön. Es freut mich dass du viel Spaß und Freude an deinem Klassentreffen hattest. You're doing so well keeping up with your stitching! I have several Santas from Prairie Schooler stitched and on my tree. I haven't seen this cute one before. Love the snowflake! My favorite motif would be the little sleigh. I'm glad that your reunion went well and so glad to know a famous person who's been on the front page! Enjoy your cool summer, I'll think of you when I'm hot and sweaty! The muffins look so good! I have to wonder if you've named your outdoor pet bunny! I love the PS Santa you've stitched. I think this is one of my favorite of their designs as it is much simpler than most of them. Hi, Carol! I love your PS Santa and snowflake ornaments! You have such an eye for color. That Vintage Country Mocha Newcastle is just yummy. I love the color variations. It reminds me of Wren from Picture This Plus. Will have to put it on my wish list at 123stitch! Thanks for the banana bread/muffin recipe. I have a favorite banana recipe but it uses lots of butter and sugar, so a healthy (and GOOD!) alternative is awesome! Love the critters who visit you. I think they’re coming for the cake! Oh! I forgot to mention in my comment that the pitcher you found at the thrift store is darling. Don’t you just love it when you find treasure like that? I found some AMAZING things at the thrift shop in my hometown... will be showing them off in my next post, so stay tuned! And that blue platter holding your muffins is absolutely gorgeous! Will have to try both those recipes. Thanks! I was not popular in school, a few friends and myself were our own group. We can't even get enough of a response to hold a reunion (same with other classes) so we have to join 3 years together as one. Even then it is sparse! You just can't beat Schooler Santas, can you? Such a lovely post, thanks! I love your blue and white ornament, it's so elegant and precious. Your reunion sounds like a big success, wonderful!! Hi Carol, you could have knocked me down with a feather when I was reading your latest blog entry. I won your giveaway!! Yeah for me! I tried to email you but I couldn't get it to work. If you could contact me at turtlecreek66@yahoo.com I will send you my mailing address. Thank you so much! Carol: I love your posts. They always make me smile! Your finished pieces are all wonderful, Carol. I especially liked the throwback piece. All the food looks yummy. Well isn't it fun to look at your older stitching pieces and remember those days gone by when you were stitching them? It takes you right back kind of like hearing the music from those times. The Schooler Santas are timeless and are as fun to stitch now as they were in the 1980s. Your finish is beautiful! The little bunny is so cute. We have rabbits here, too, and the little ones are so dear. I think a lot of people are reading your blog, Carol. Indeed it is a lot of work, but even if you were doing it just for your mom, it would be worth it. It is a wonderful visual record of your life and accomplishments and it is so inspiring for your readers. Thank you for continuing to write it. I enjoy it so much. Your PS Santa finish is first rate as always. I am glad you worked through the nerves and enjoyed your reunion. Old friends are dear with all the shared childhood memories. I recently had dinner with a woman I'd gone to school with from kindergarten through high school. We decided the last time we'd seen each other was in 1977 - 41 years ago! Wow! We had a wonderful time and hope to visit more frequently. Enjoy the rest of your summer and your lovely patio visitors. Oh yes, it's really really hot here. And I even shouldn't complain as I live in the mountains and the temperatures are always a bit lower than in other parts of the country. But I'm not made for this heat and I'm always glad when the heat waves are over an it's back to more moderate temperatures. I love your two choices for this and last months ornaments. So different in style but so sweet both of them. I hadn't known that Prairie Schooler is continuing their yearly Santa series. But I think I have to stay away from buying them - first I have to stitch some of the ones that I already have. That's the ongoing dilemma we stitchers all know, isn't it? Lol. Glad to read that you were enjoying your class reunion and could renew old friendships. These reunions aren't always like that (unfortunately I know that from my own experience). 45 years is such a long time and it was certainly exciting to see some of your old friends and class mates again. These muffins look so delicious and I'm sure they were absolutely delicious. And now I have to go and see Mary's post about the wineberry cake. It's certainly just as good with raspberries, one of my favorite berries. Your stitching is always so gorgeous!We have had nearly 6 inches of rain down here in southern Delaware in the last few days! The weather has indeed been crazy! I love the pitcher that you found at Goodwill, it is so pretty. I have just literally fell upon your blog and I'm hooked. 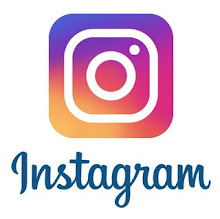 I will be following you from now on. It was the Briar Rabbit post on 26 March 2015 that I landed on. I loved it. Thank you for sharing. More great ornaments for your beautiful tree! Town Square is an oldie, but goodie, it looks perfect. Thanks for the link to her designs. Mmmm, those muffins look delicious! Happy Birthday to your husband, and Happy Anniversary also. What a cute little bunny. Your Christmas ornaments are so pretty! The round ornie is so sweet! I really like the new 2018 Santa from PS! I complained about the heat and then it went away! I shall complain about the drought next; maybe that will solve itself too haha. I enjoy baking too but it's been so hot that I hate to use the oven. Crock pots for everything! Ooo that fabric looks perfect for the PS designs and your new ornament finishes look great too! I think blue and white are great for little wintery designs. Like a frosty morning! The cottage is definitely my favorite! What a great post - wonderful stitching, a good blog link, and recipes. So glad to see a new post from you any day. So glad your reunion was special. I'm meeting with three classmates in the next two weeks and expect the same kind of kicks and giggles. Two more gorgeous finishes. Love your oldie but goodie. Congrats Karin on winning. I'm so glad to hear your reunion went fantastic. I guess since you're famous now you'll start charging us to read your blog haha. The muffins and cake look delicious. 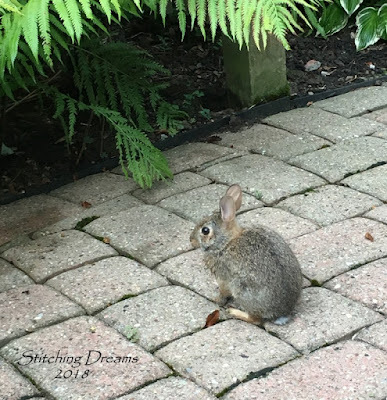 We have several bunnies that run around in our yard. We love them as long as they leave our tomato plants alone which so far they have. Glad you had a great July. Hope you have a fantastic August too. I love your PS Santa Carol,and I enjoyed looking at the catalogue of previous Santas,thank you for putting a link. Your school reunion sounded great fun,you must all have had so much to catch up on. I do like your 30 year old sampler,the colours are so fresh. I hope you have a great August. I didn't know PS was continuing their yearly Santas, but I'm glad they do, I really like them. Great finishes, and I'm glad you had a grand time at your reunion! Oh yes you're definitely famous Carol! I'm so glad your reunion went well. I didn't have the best time in high school but I loved my 6th form college (Age 16-18) and would love to see everyone again. I bet it was fun to see how everyone has changed. Your finishes are so beautiful! I love the JBW Designs, I have stitched a couple and they are so much fun seeing the little motifs appear! Yours looks so pretty on that lovely blue fabric. Wow, just 100 students in your graduating class? Now I can see how a reunion for a class that size might be worthwhile! Glad it was so fun and worth going! Love the front page picture. :D Love your ornaments too, of course. Hope the rest of the summer is good to you! Oh yes, blue and white is a gorgeous combination. Love all your projects! We've had the heat here over the last week and then smoke from all the fires from B.C., Idaho, Oregon, California, and Washington is surrounding us, and no matter which way the wind blows, we have smoke. We seem to be getting a change in the pressure tonight and we're hoping for better conditions in the morning! Hope you're having a great week - hugs!! The Santas of Prairie Schooler are great, so simple but wonderful. The snowflake looks very nice too, many small motifs in a big one. I'm glad that the class reunion made you so much fun. A sweet little bunny, maybe he belongs to someone in the neighborhood who feels very comfortable with you. Great stitching, I am a fan of reindeer so approve of both ornaments! I really like that snowflake on though! Glad you had so much fun at your reunion. I had similar feelings (but no hives) as I drove up to my 20th college reunion a few years ago. It’s nice when all the nerves melt away and you enjoy time with good friends! The heat is back in Indy this weekend and I’d guess it’s headed your way too. We really enjoyed a couple weeks of cool, dry weather in July here. Have a good weekend Carol! Congrats on the gorgeous finishes Carol. Your reunion sounds like fun. Hi Carol...I'm late to the comment party this month! You could certainly go into the finishing business...your Santa and snowflake are beautiful! And you are right...the "Town Square" stitch looks current as can be...houses and alphabets never get old, do they? You're definitely famous, Care! That cake looks amazing! I love the way that Santa is "hangin'" with his buddy--Mr. Reindeer. Looking back at your piece from thirty years ago, I'm amazed. I cannot imagine being as creative and patient as you have been throughout your years of stitching (especially when I dread even having to mend a shirt that is missing a button). Truly astounding! Love you! Happy anniversary, your cakes look so delicious. I also like the Santa very much, the sweet snowflake too. And your reunion must have been great. Wonderful post Carol, pretty stitching, lovely Prairie schooler Santa with the gingham bow and the pretty snowflake. I bet you enjoyed your reunion with old school friends, what a laugh you must all have had. Yummy cooking and what a sweet little bunny to visit each day.